FETA have published a guide to A2L refrigerants and their use in Refrigeration, Air Conditioning and Heat Pump applications. From January 2017 all new cars must use a refrigerant with a GWP below 150, in line with EU MAC Directive. 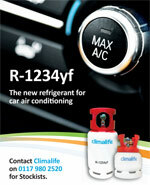 R-1234yf low GWP refrigerant offers the ideal solution. Take action on R-404A now! "Take action on R-404A now!" 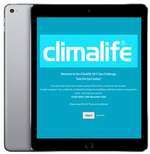 was the underlying message at Climalife's two recent customer events held in March. The Climalife team would like to wish all their customers, colleagues and business partners a very happy new year! The F-Gas Challenge - Winner & Answers revealed! Having seen over 300 visits to our F-Gas Challenge quiz, we are now pleased to announce that we have our winner. Chemours has announced the availability of its new range of low GWP HFO-based “mildly flammable” refrigerants. The new Opteon™ XL Series currently comprises five refrigerants; Opteon™ XL10 (R-1234yf), which can replace R-134a, Opteon™XL20 (R454C) and Opteon™XL40 (R-454A) both potential alternatives to replace R-404A and R-507. Whilst Opteon™XL41 (R-454B) and Opteon™XL55 (R-452B) are two new blends to replace R410A. All are classified by Ashrae as A2L “mildly flammable” refrigerants.